A Full colour print of the Coat of Arms most commonly associated with your family’s surname.These items have been carefully researched using the most recognized historical sources. 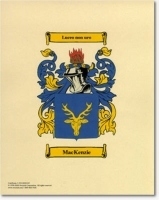 The images have been computer drawn according to heraldic standards, and the final product is printed onto a sheet of A4 parch-tone paper and shipped in a mailing tube. To research your family name origin, surname history, genealogy or heraldry , please use the search box on the left.